There is great book by Claire Ridgway that I recommend if you are new to the Tudor era or just new to some of the diseases that were plaguing the population during that time. The sweating sickness is by far one of the greatest mysteries of the Tudor era because no one knows exactly how it originated, although many scientists and medical historians have a good idea given some of the contemporary records. Claire Ridgway makes the distinction that she is not a doctor but has done a great deal of research on this topic (and she has also made a video on this topic which is a shorter version of the book) and has come to several conclusions, the main one being that this disease could have been the result of several things, including lack of hygiene in universities, homes and other places. She goes on to elaborate on other possible factors such as this being a new strain of influenza or a combination of various factors that made it possible for this to spread so fast and kill so effectively. The Luminarium project website has an article on this subject that is straight from the Encyclopedia Britannica, third edition that dates back to 1910, leaving it clear that the disease hadn’t been brought to England by Henry’s soldiers but that it was already native to England. Redness of the face and body. English physician John Caius was more detailed in his description of the disease, adding that the muscular pain would be accompanied by redness, abdominal pain, cardiac palpitations and dizziness. Game of Thrones, being partly based on the wars of the roses and the era after it, has sided with many novelists by having Ser Jorah on the show and Young Griffin’s (fake Aegon –sorry guys but I don’t think he is the real deal) guardian in the books be the ones that bring a horrible disease back to Westeros. The show and books could surprise us by having these two characters finding some sort of miracle cure that stops it from spreading –sort of like what happened to Shireen- but it is unlikely. And it might be that the Stonemen’s disease or Greyscale, be Martin’s version of the sweating sickness in Westeros. This would certainly make things difficult for Dany. The sweating sickness certainly did for Henry as it prevented him from going to certain places, or traveling alongside his wife years afterward. The sweating sickness was more deadly on England, killing many people and making no distinction between rich and poor. Henry VII’s surviving son and heir, Henry VIII, could have come this close never to marrying Anne Boleyn because she happened to be one of the victims of this sickness. Thankfully for her and her family, she recovered. Other members of the nobility and the royal family weren’t so lucky. Take the Brandons for example. Charles Brandon’s last wife, Catherine Willoughby gave him two sons who survived infancy but didn’t live beyond that. During the reign of Edward VI they died, leaving the poor Duchess devastated. The sweating sickness would go on to hit again with the last recorded incident in 1652 in Leipzig. This new variant of the disease would also be seen in other parts of the globe such as in France, Spain in Holland during the nineteenth century. There were many attempts to cure it or control it with Henry VIII, who like his paternal grandmother, had a fascination with the natural world, keeping a detailed journal where he came up with several tonics and remedies to combat this disease. Daenerys sends Jorah away to find a cure. Some fans believe that Jorah will find himself back to the Quaithe, the mysterious masked figure viewers were introduced to in season 2 and whom book readers have long speculated about since we were introduced to her in ‘A Clash of Kings’. The first trailer for season 7 shows us as a disgusting looking arm with ridges, dried up blood and stone looking skin which leads us to believe it is Jorah and that maybe (like Shireen) he has found a way to stop the disease from spreading or that he hasn’t and like the rumors surrounding Henry’s men bringing the sweating sickness to England, he will bring a deadlier strain of the disease to Westeros, causing more deaths and more additions to the army of the undead. Ridgway, Claire. The Sweating Sickness: In a Nushell. Made Global. 2014. Lisle, Leanda. Tudor: Passion. Murder. Manipulation: The Story of England’s Most Notorious Royal Family. Public Affairs. 2013. Those in the UK will be lucky to see the new mini-series adapted from Hilary Mantel’s novels, Wolf Hall and Bring Up the Bodies, this January. For those of us in America, we will have to wait until April when it’s aired on PBS. In spite of the long wait. Let’s review on the accuracy of this show. So we have no cod-pieces because they thought American audiences, or others for that matter, would squirm at it. Okay BBC, first of all, not all of us in America are ignorant about cod-pieces or the fact that they are not sexual in any way. But anyways, refraining myself from an upcoming rant I will go to the most important points of this article: Accuracy. And how does Wolf Hall score in this respect? To be honest, it was about time we had a series that other from being entertaining and being a Glee-style travesty of history, invested its big budget on accuracy. “The Tudors” was entertaining, many people liked it (myself included) but it was not accurate. Not by a long shot. In terms of acting it was great, new talent was discovered, young actors got their careers bolstered and I am glad. But the series missed a lot of good points such as Henry VIII’s two sisters that got merged into one because apparently Hirst believed we (the audience) would be too stupid to distinguish from the many Marys on the show. Hilary Mantel thankfully is not making the same mistake. And neither does the production team behind “Wolf Hall”. There has been an intricate attention to detail, from costuming to the way people acted or were attended by their ladies. in this scene where Anne Boleyn is about to be crowned; she is not just about to be crowned in the traditional sense as we’ve seen on TV. But the complete ritual is about to be displayed. 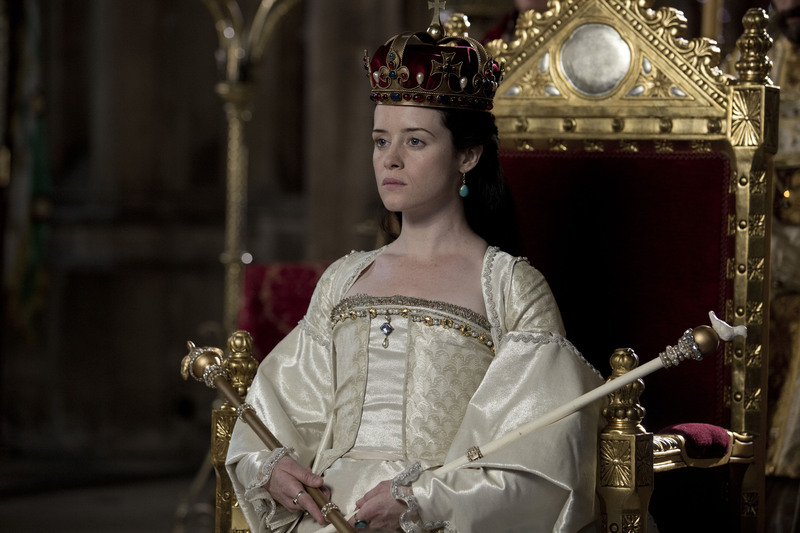 She sits in the chair, crowned with a beautiful white dress and is visibly pregnant. She holds the scepter and the rod and on her forehead is none other than the heavy crown of St. Edward. Let’s remember this because it is very important! Anne was not crowned as her predecessor was with the traditional crown worn by Queen Consorts. She was crowned with the crown of St. Edward. Henry wanted to make a powerful political statement that this Queen was not only going to be his true queen and his true wife but that their heir that was nestling safely in her womb would be his undoubted successor. 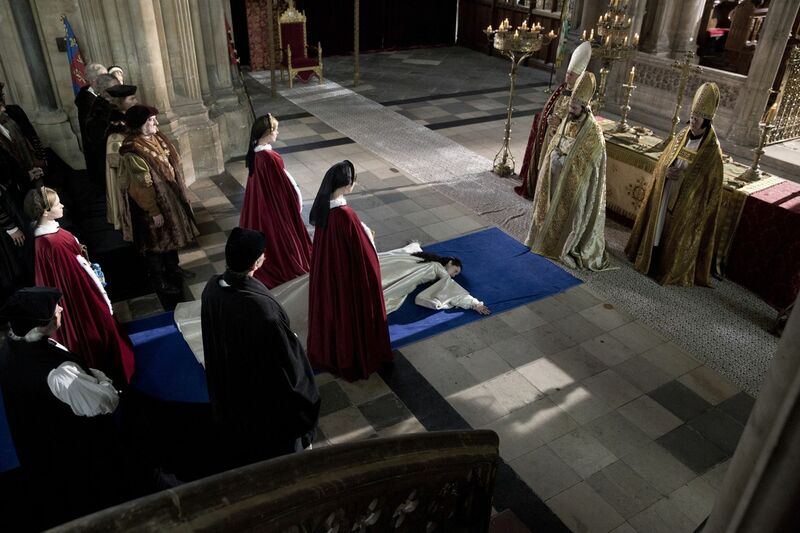 Anne Boleyn accurately prostrates herself before the altar, before sitting on the chair and being crowned. This ritual has not been depicted in the latest historical dramas. Anne’s victory was nearly complete. now all she needed was to give birth to a son. Anne was visibly pregnant during the ceremony, some whispered she had conceived before their marriage in January of that year (some historians place it before or after, depending on what sources they are using). This ceremony was significant because it guaranteed Anne’s place next to Henry and their offspring’ legitimacy. In spite of all of this; there are some things that the series missed and this is that it will keep perpetuating the ‘dark Spaniard’ myth that all Spaniards are dark-haired- dark-eyed, etc. Now the actress portraying Katherine of Aragon is not black-haired as Irene Papas in the “Anne of a Thousand Days” movies but she wears too much make up that makes her look too old and she looks very thin. Katherine of Aragon had grown plumper as her predecessor, her mother in law Elizabeth of York had. The series of miscarriages and tragedies she had suffered -and the added stress- made her lose her figure but by no means did she look *that* old. Secondly, it was Anne who was dark-haired and dark-eyed and had olive skin and Katherine who was red-haired and with fair skin and blue eyes. Joanna Whalley by contrast is fair skinned, but her hair is not red enough and her eyes are dark brown, but at the same time she is shown wearing gable hoods and wearing the color purple which is very important if we want to talk about accurate costuming. Tudor society was very elitist. Everyone was put into boxes, or categorized according to their wealth and lineage. Thomas Cromwell and his family wear very sober colors, they have a lot of material artifacts thanks to the social mobility experienced during this period; but this doesn’t change the fact that they are still part of the middle class and not the elite. Royals, as they were above everyone else would wear specific colors. Purple was one of them. 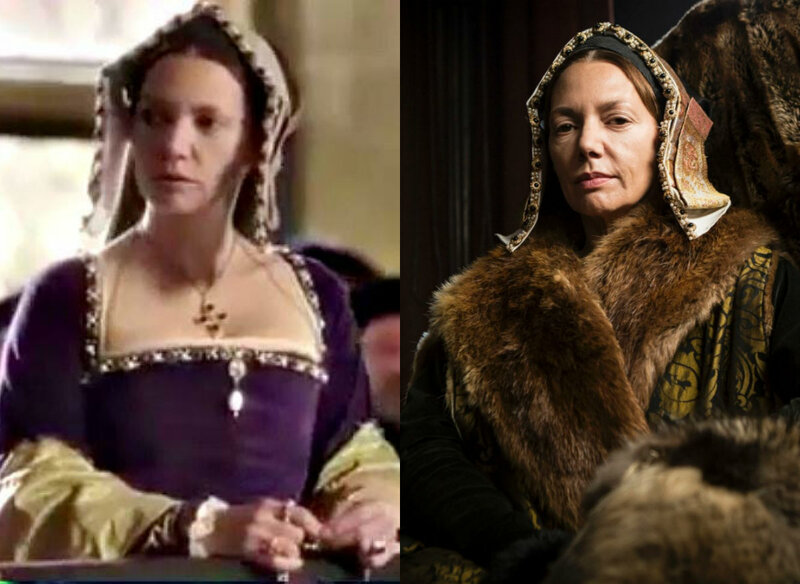 Wolf Hall’s Katherine of Aragon (played by Joanne Whalley) looking older in the second picture, once again perpetuates the Spanish stereotype. Although she is younger in the first episode, and wears the color purple and a gable hood; she still doesn’t fit the mold of Katherine. Katherine was red haired -a fact that is mentioned in the episode when Wolsey remarks to Cromwell how “beautiful” she was and “how she dances, that red hair”- with blue eyes. This Katherine’s red hair has lost its shine, but her eyes are dark brown. But I guess, like with Katherine of Aragon, we can’t have it all can we? Nonetheless, the production looks very good, the clothes are very accurate, the hoods, the castles -the way they are decorated-, and everything else in general looks spectacular and I, as many history buffs, will be looking forward to this production when it hits the States in April.